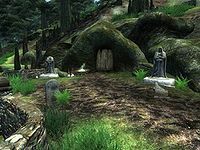 Amelion Tomb is a medium-sized cave northeast of Leyawiin containing undead (quest-related). It contains two zones: Amelion Tomb and Sarcophagus Chamber. This cave can be entered, fully explored, and all items retrieved without starting the related quest. The unique Brusef Amelion's armor and sword can be found here. 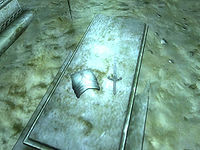 Acquiring and losing the cuirass and sword before the quest will force you to pay off Biene Amelion's debt of 1000 gold. This cave contains 43 Wisp Stalk plants. The entrance to the tomb is in a small graveyard next to the banks of the Lower Niben. 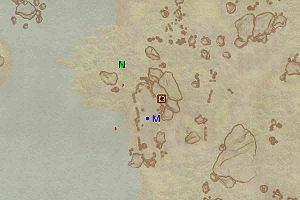 This location's map marker (M on map) is named Amelion Tomb (editor name AmelionTombMapMarker). The entrance door is NE of the marker, 30 feet away. 1 Daedra may appear near the entrance if the nearby Oblivion Gate is open. Up to 2 Mud Crabs may appear near the entrance. This zone contains all but one of the unenchanted items included in Brusef Amelion's Armor, all thoroughly hidden and worth picking up due to their unique appearance. During the related quest, map markers will point you towards the items requested by Biene Amelion, both of them located in the second zone, the Sarcophagus Chamber. Upon arriving, go through the empty tunnel until you reach a room with a sole enemy and a hole in the ceiling. 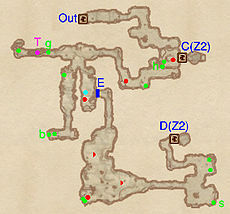 Proceed forward until you reach a three-way intersection and pick the path straight ahead as it leads to the unique gauntlets at g and a minor loot chest, both of them in close proximity of a Cave In trap at T. Return to the intersection and find the two paths leading south. Choose the right path for a locked coffin and, hidden behind it, the boots at b. The left path takes you to the rock wall at E, removed by pulling the nearby rope (cyan dot on map). In the next room, fight up to three undead enemies and proceed east through the wood door. The final room contains Brusef's shield behind a broken crate at s and the tunnel leading to the Sarcophagus Chamber through door D.
When you return to this zone from door C, loot the chest and locate the last unenchanted item, Brusef Amelion's Helmet almost hidden behind the wisp stalk plants at h. Finally, jump down the hole and backtrack to door Out, leading outside. 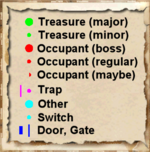 1 Cave In trap at location T on map. 2 doors (at C and D) lead to the zone Sarcophagus Chamber. 1 Rock Wall is at location E on map, opened by a rope pull (the cyan dot on the map). Upon entering from door D, the very first chamber is guarded by up to seven Undead enemies, so be prepared to fight your way through. Loot the many coffins and heal if necessary, then proceed north to the Sarcophagus Chamber and the boss-leveled Undead at A. 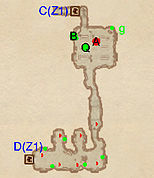 After the inevitable fight, locate the quest-related Cuirass and Sword in the ray of light at Q, then pry open the boss chest at B. Additionally, Brusef Amelion's unique greaves can be found in the northeastern corner at g. Finally, take the northern tunnel towards door C, leading back to a previously inaccessible area of the first zone, Amelion Tomb.